for energy efficient homes, decent incomes and low cost fuel for low income households. Friday 15th 2019 is Fuel Poverty Awareness Day, a nationally recognised day to raise awareness of fuel poverty and the importance of living in a warm and safe home. The day is coordinated by End Fuel Poverty Coalition (EFPC) member, National Energy Action (NEA) and concludes the Warm and Safe Homes Campaign. Fuel poverty is the condition by which a household is unable to afford to heat their home to an adequate temperature. This is influenced by three factors; low-incomes, high energy costs, and energy inefficient housing. A shocking 4 million UK households are in fuel poverty and living in cold, damp and unsafe homes. The effects of such can be detrimental to people’s health, quality of life and wider communities. This includes negative impacts to physical and mental health, increased social isolation, poorer educational attainment and reduced economic productivity. Our health services spend £3.6 million every day treating the effects of fuel poverty and 15,000 of the 50,100 excess winter deaths last year were attributed to cold homes. Show your support on social media using the hashtags #FuelPovertyAwarenessDay and #WarmSafeHomes. Make sure you are following the EFPC (@EndFuelPoverty) to keep updated! Change your profile picture on Twitter to the Fuel Poverty Awareness Day logo. 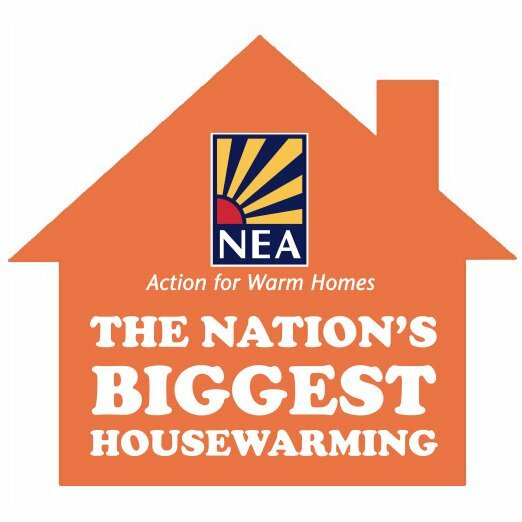 Read and share NEA’s Warm and Safe Homes Action Guide available to download here. Take part in the Nations Biggest Housewarming by hosting your own fundraising event. This might be a bake sale, fancy dress day or a dinner party. Click here for more information on how to register your event. Don’t forget to share any photos from your event on Twitter using the hashtags #neahousewarming or #neamugshot! Find out more about Fuel Poverty Awareness Day on NEA’s website. Keep an eye on our Facebook and Twitter pages for more updates.